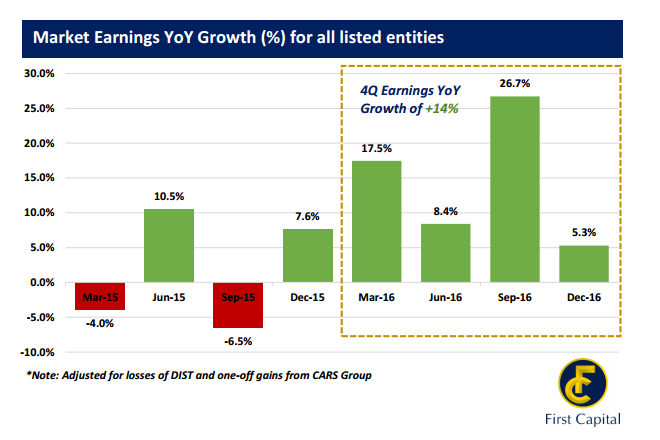 Apr 03, 2017 (LBO) – Earnings of Sri Lanka’s listed companies grew 5 percent, year-on-year, during the December quarter supported by the banking and diversified sectors, First Capital said in a research report. However, energy and utilities under-performed contributing to the slower growth in the quarter compared with 26.7 percent year-on-year growth during the September reporting season. The banking sector was the largest contributor to earnings achieving a profit of 15.2 billion rupees, up 20 percent YoY, driven by stronger net interest margins and higher than expected private sector credit growth, despite increased VAT, First Capital said. COMB (+26% YoY), HNB (+14% YoY) and SAMP (+67% YoY) represented 72 percent of sector earnings. Improved performance in the Capital Goods Sector, which posted a net profit of 12.7 billion rupees (+14% YoY) was driven by JKH (+32% YoY) and DOCK (+93% YoY). JKH saw strong retail segment and higher finance income with rising interest rates while DOCK experienced better margins via ship repair activities. Market earnings were negatively affected by the Energy Sector which recorded a net profit of LKR 72Mn (-94% YoY) driven by LIOC (-71% YoY) & LGL (-170% YoY) which saw a steep dip in margins due to increased oil gas prices in the global market. Utilities Sector posted a net loss of 14 million rupees (-102% YoY) due to lack of rainfall affecting many hydro power plants including VLL (-111% YoY) and VPEL (-70% YoY). One-off events affected 4Q16 earnings, with losses of 74 billion rupees attributable to DIST during the quarter following share swap arrangement with MELS. In addition, 5 companies of the CARS Group (+377% YoY) — BUKI (+509% YoY), SHAL (+20,060% YoY), INDO (+21,649% YoY), SELI (-826%) and GOOD (+52,245% YoY) — together recorded a total gain of 12.6 billion rupees attributable to disposal of plantation assets. After adjusting for these gains and losses the sector resulted in a profit of LKR 9.1Bn (-7% YoY, adjusted).